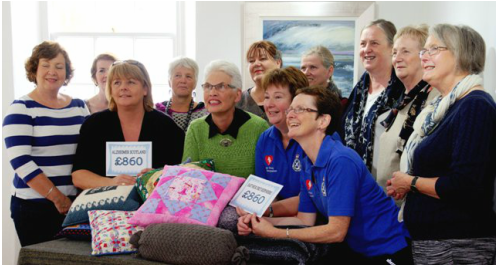 Couthie Cushions raise a comfortable £1,720 for charity. Pittenweem Arts Festival Community Craft Project completed its 5th year, and more people than ever have contributed. This year not only knitters and crocheters took part, but quilters were also invited. They gave the cushion making project a new dimension with their craft. In all 112 cushions were made, of which two thirds were sold. Previous projects have been fish, tea cosies, hats and flowers. The money raised this year went to Alzheimer Scotland, who will use their donation locally, and East Neuk First Responders. They each received a cheque of £860. To follow our projects log into the website of our local wool shop: www.thewoollybrew.co.uk.